Three friends on a long weekend in New Orleans. With this simple premise begins a tale of self-discovery and understanding. A tale inhabited by a gallery of colorful characters: A philosophizing drag queen/security guard; a benign and insightful cemetary caretaker; an overzealous society matron; and Loveshack, the world's ugliest stripper. These and others act as a Greek chorus to our trio, as they find their way through life in the Vieux Carré. The New Orleans Story takes us on a journey from the palatial country clubs of Louisiana's richest families to the decadent stages of Bourbon Street's strip bars. A journey that ultimately leads, at 30,000 feet above the Gulf of Mexico, to a greater understanding of a better way of life. 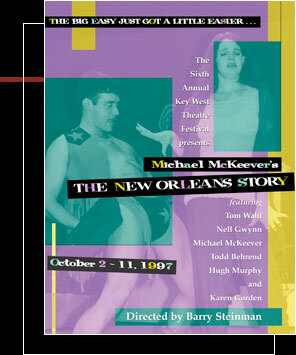 "A funny, clever, unpredictable romp down Bourbon Street." "Sure to keep audiences laughing."